“Real estate in San Jose and Basking Ridge is expensive. But ask yourselves this: “How expensive is the real estate on the CIO or CEOs desk?” That’s the development opportunity. Well said! As a CTO/CIO myself, I rent out my desk at $10,000 per square inch. Any takers out there? Anyway, go check out Greg's excellent full report. Rich, who never leaves his Verizon XV6700 Windows Mobile device is always ready to snap a picture and post it to his blog. So I've been waiting for photo reports from the show. 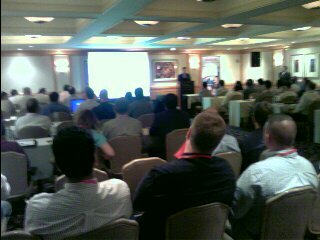 Sure enough, he posted this photo on the right depicting the packed Avaya Developer Day conference. Rich says in his blog post, "Hat's off to Avaya who now has over 5,000 partners in the Developer Connection program. When they first held this day at the first VoIP Developer show a few years back they only had 250 members. This is dramatic growth in such a short time." Dramatic growth indeed. I think seeing a strong IP communications conference with a focus on software developers, engineers, MIS/IT, and CTO/CIOs, means we will see some interesting communications applications developed in the near future. With the convergence of voice, video/TV, wireless & cellular, triple/quadruple/quintuple play, the developers have to manage converged billing, video copyright issues, QoS, standards compliance, and a host of other issues. 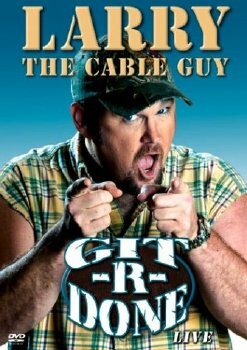 On top of that, developers have to contend with impatient CEOs and sales staff telling the developers they don't want to hear excuses or why there are delays - just GIT-R-DONE! Wish I was at the show, but I'll just have to keep an eye on Rich's and Greg's blogs. Internet Telephony Conference & Expo (ITEXPO), which is being held in the massive Los Angeles Convention Center, is just around the corner. Ok, so it's not till September, but the summer months for me just fly right by. Can't wait to cover the latest products at ITEXPO. ITEXPO is where I get my best VoIP news and interviews! \n “Real estate in San Jose and Basking Ridge is expensive. But ask yourselves this: “How expensive is the real estate on the CIO or CEOs desk?” That’s the development opportunity. \nWell said! As a CTO/CIO myself, I rent out my desk at \$10,000 per square inch. Any takers out there? Anyway, go check out Greg's excellent full report. \n Rich, who never leaves his Verizon XV6700 Windows Mobile device is always ready to snap a picture and post it to his blog. So I've been waiting for photo reports from the show. Sure enough, he posted this photo on the right depicting the packed Avaya Developer Day conference. \nRich says in his blog post, "Hat's off to Avaya who now has over 5,000 partners in the Developer Connection program. When they first held this day at the first VoIP Developer show a few years back they only had 250 members. This is dramatic growth in such a short time." \nDramatic growth indeed. I think seeing a strong IP communications conference with a focus on software developers, engineers, MIS/IT, and CTO/CIOs, means we will see some interesting communications applications developed in the near future. With the convergence of voice, video/TV, wireless & cellular, triple/quadruple/quintuple play, the developers have to manage converged billing, video copyright issues, QoS, standards compliance, and a host of other issues. On top of that, developers have to contend with impatient CEOs and sales staff telling the developers they don't want to hear excuses or why there are delays - just GIT-R-DONE! \nWish I was at the show, but I'll just have to keep an eye on Rich's and Greg's blogs. \nInternet Telephony Conference & Expo (ITEXPO), which is being held in the massive Los Angeles Convention Center, is just around the corner. Ok, so it's not till September, but the summer months for me just fly right by. Can't wait to cover the latest products at ITEXPO. ITEXPO is where I get my best VoIP news and interviews!